Today I’m moving on from novellas to poetry, with a couple of short works I randomly threw together. Of course, as is often the case, if you look hard enough, you can find connections anywhere – and today I didn’t have to look very hard at all… Fasten your seat-belts; today sees us crossing the Rhine (in style, of course!). 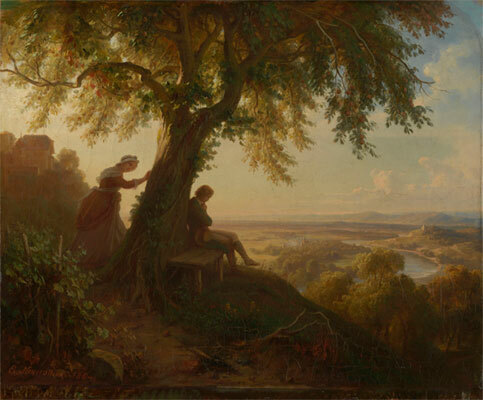 First up today is Goethe’s Hermann und Dorothea, a late-18th-century pastoral story of a rural romance. Hermann, an innkeeper’s son, is out one day offering supplies to refugees fleeing from the French troops who have pushed the Germans back over the Rhine. Suddenly he sees a beautiful, gentle maiden who is taking care of a woman and her child – and, well, you can guess the rest… After a brief trip home, Hermann returns with a couple of friends, determined to find out more about the lovely Dorothea and, if possible, to bring her home as his wife. There is a rather political background to this work. The setting is a time when there was no German nation, just an abstract dream of uniting hundreds of independent fiefdoms which shared a (fairly) common language and heritage. Goethe is setting up his two characters as examples of Germanic ideals, prime caring Teutonic citizens who work hard for the common good. Moving on fifty years or so (it’s lucky that the bus has time travel as a standard feature…), we’re crossing the Rhine once more – in the same direction, but with very different feelings. The German poet Heinrich Heine spent most of his later life in self-imposed exile in Paris, reluctant to expose himself to danger from the ever-present Prussian censors. Like any good German though, he did get homesick, and the result of one of his rare journeys home resulted in the poem Deutschland. Ein Wintermärchen (Germany. A Winter’s Tale). Things have changed since the writing of Hermann und Dorothea, and not for the better. German unification is only a matter of decades away, but it will be achieved under the jackboot (and I use the word deliberately) of the powerful state of Prussia. The creation of a major German-speaking state is to be achieved not by a coming together of minds, but by one state gobbling up dozens of others and becoming a major player in European politics. When English speakers today think of typical negative German stereotypes, it’s often the legacies of the Prussians that we have in mind. With bread and meat and soups! I did enjoy Deutschland. Ein Wintermärchen, but it wasn’t the beautiful poetry I had been expecting. It seems more like comedy at times, a little slapstick and verging on limerick-style in places. In his introduction, Heine says that in getting the book past the censor, some of the bite has had to be extracted, and that there is, perhaps, too much humour. I would certainly agree that the satire is a lot tamer than it might have been. I must admit – I've don't really get a lot of poetry and both of these don't seem to be for me. But my great-grandmother was a real lover of Goethe. I remember a large ebony bust of him in her living room. She was a woman who had little time for anything frivolous or a waste of her time, so the fact she gave so much energy and time to Goethe must mean something.. I'm glad you found the gear marked poetry on the bus, have recently been reading about the period prior to the rise of Germany as a single entity in one of Oxford University Press's German Literature A very Short Introduction. As far as poetry goes, I've seen better (the Rilke I read last year, for example, was more what I expected). The other name that always comes up is Hölderlin, so I might try some of his one day. Nice reviews, Tony! Your comment on Goethe's strikerate made me smile 🙂 I read a short story by Heinrich Heine last year called 'Gods in Exile' and liked it very much. I haven't read his poetry though. This looks like an interesting poem to explore. Thanks for the review. Vishy – I'm sure Goethe isn't always this weak (I've been reading the wrong works…). Heine and Gothe are very accessible poets, not complex, many of the poems could be or have been turned into songs. I think they ae lovely but very far from what I love in poetry usually. Hölderlin is VERY different. I like him a lot. As for Gothe, Faust is amazing but Die Wahlverwandtschaften is a book I like a lot too. I love that name 'Die Wahlverwandtschaften' 🙂 I didn't know that was the original German title of 'Elective Affinities'. I've just started on “Deutschland. Ein Wintermärchen” and I'm glad I'm not the only one who expected the poetry to be better. It seems a bit “Reim Dich oder ich fress' Dich” at times, as we say in German when someone is forcing their rhymes a lot. I'll let you know when I'm done!